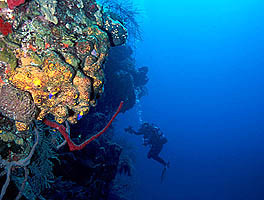 Along the edge of most Caribbean islands and along the Yucutan Peninsula are vast underwater cliffs called "walls." 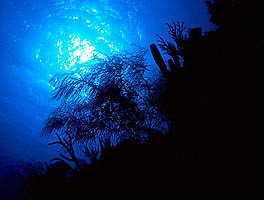 Click here to see two pictures along the underwater walls near Belize. 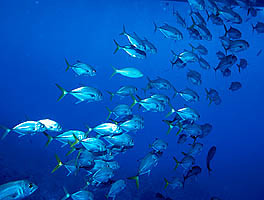 Many open-water fishes swim in schools. These Horse-Eye Jacks are no exception, and we saw about 100 of them swimming in a school along the wall at Aquarium Reef in Belize. Click here to see this school in detail.